Nowadays, many historians regard 1963 as the height of the Civil Rights movement in America, which many African-Americans had devoted themselves to, and had been working towards the day when America would be fully integrated. That was the day that they had long dreamt about. Sometimes, it seemed tantalisingly close, other times, it looked as if their dream of integration and equality was out of reach. However, the members of the Civil Rights movement were never going to give up on that dream. Their American Dream was integration and equality. Especially as many African Americans made a conscious decision to re-enter politics, even in the deep South. Other young African Americans became involved in the Civil Rights’ movement. It looked as if this was a new beginning in America. Ironically, as The Senate debated The Civil Rights Act of 1968 Dr. Martin Luther King Jr was assassinated in Memphis, on April the ‘4th’ 1968. This lead to the worst ever wave of civil unrest. Suddenly, filibustering was a thing of the past. The House passed The Civil Rights Act of 1968 on April ’10th’ and President Johnson signed it a day later on the ‘11th’. Although this was a important day for African-Americans, the death of Martin Luther King Jr, who had been an inspirational figure for many within the Civil Rights’ Movement. This included in Memphis, the city where thirty-nine year old Dr. Martin Luther King Jr lost his life. Many African-Americans were left reeling at the loss of such a brave and inspirational figure who had touched their lives. So had another man who died the previous year, 1967, Otis Redding. The legendary soul singer was just twenty-six when his plane crashed trying to make an emergence landing at Madison, Wisconsin on December the ’10th’ 1967. That day, soul music lost a true great, and one of seven who lost their lives that day. This included four members of the Bar-Kays, who like Otis Redding were signed to Stax Records. This was just the latest disaster for Stax Records during 1967. Earlier in 1967, a deal with Atlantic Records was dissolved and gave the label perpetual rights to Stax’s back catalogue. To make matters worse, after the end of the Atlantic Records’ deal, Sam and Dave left Stax. Rubbing salt into the wound, the two soul men signed to Atlantic, but still released their music on Stax. This was the latest chapter in what was an eventful and traumatic year for everyone at Stax. As 1968 dawned, Stax had no option but to reinvent one of soul music’s premier labels. Stax released real soul, not the sanitised brand version that was churned out of the Motown assembly line. However, as the reinvention of Stax began, the death of Dr. Martin Luther King Jr had a massive impact on the label’s direction. The resulting social, political, and cultural catastrophe’s would affect the way Stax was run, and the music it released during 1968. That music is found on Stax 68: A Memphis Story, which is a five disc box set released by UMC. Stax 68: A Memphis Story features 134 tracks, which consists of the sixty-seven singles released by the label during 1968. Opening disc one of Stax 68: A Memphis Story is Otis Redding’s classic posthumous single (Sittin’ On) The Dock of the Bay, which was Stax’s first single of 1968. This was followed by Sam and Dave’s I Thank You, which was their swan-song for Stax. Other highlights on disc one include Shirley Walton’s I Was Born To Love You, plus Eddie Floyd’s Big Bird which documents his story of flying to Otis Redding’s funeral. These tracks are joined by Johnnie Taylor’s Next Time, William Bell’s Every Man Oughta Have A Woman and Jeanne and The Darlings’ What Will Later On Be Like. They’re a tantalising taste of the music being released by Stax during 1968. There’s no shortage of highlights on disc two of Stax 68: A Memphis Story, including of Lynda Lyndell’s Bring Your Love Back To Me and Carla Thomas’ I Want You Back. Two of the most influential figures in the history of Stax contribute standout tracks including Isaac Hayes’ Precious Precious and Otis Redding’s B-Side Open The Door. Albert King’s You’re Gonna Need Me, Johnnie Taylor’s emotional reading of Where There’s Smoke There’s Fire and Shirley Walton’s The One You Can’t Have All By Yourself are all welcome additions to Stax 68: A Memphis Story. There’s twenty-nine tracks on disc three of Stax 68: A Memphis Story, and it’s highlights aplenty. This includes Booker T. and The MG’s’ classic instrumental Soul Limbo, Eddie Floyd’s I Never Found a Girl (To Love Me Like You Do) and Delaney and Bonnie’s powerful rendition of It’s Been A Long Time Coming. Quite different, and very beautiful and emotional are Johnny Daye’s pleading Stay Baby Stay, Bobby Whitlock’s cover of And I Love You and Judy Clay and William Bell’s classic duet Private Number. Then there’s Jimmy Hughes’ I Like Everything About You, Lindell Hill’ rueful reading of Used to Be Love. Judy Clay’s Remove These Clouds and The Staple Singers’ Long Walk To D.C are both powerful songs and perfect to close disc three of Stax 68: A Memphis Story. Disc four of Stax 68: A Memphis Story opens with The Staple Singers’ Stay With Us and includes highlights like The Soul Children’s Give ‘Em Love and Carla Thomas’ I’ve Fallen in Love. They’re joined by Jeanne and The Darlings: “I Like What You’re Doing To Me, Eddie Floyd’s Bring It On Home To Me and Booker T. and The MG’s’ Hang ‘Em High. Closing disc four is Bar-Kays’ In the Hole, which is something of a hidden gem. 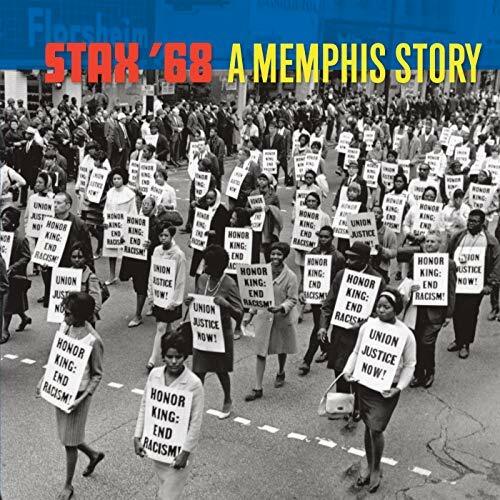 The fifth and final disc on Stax 68: A Memphis Story features contributions from familiar faces and some of the lesser known names that caked Stax home, even briefly. Among the highlights are William Bell’s rueful I Forgot to Be Your Lover, The Soul Children’s I’ll Understand and The Staple Singers’ The Ghetto. Bluesman Albert King’s Night Stomp and Rufus Thomas’ I Want to Hold You are both welcome additions and so is Johnnie Taylor’s Hold On This Time which closes disc five of Stax 68: A Memphis Story. For fans of soul music, the lovingly curated five disc box set Stax 68: A Memphis Story, which was recently released by UMC, is one of the box sets of 2018. It documents what was one of the most important years in the history of Stax. Sadly, it was also the year that Dr. Martin Luther King Jr was assassinated in Memphis. This changed the music that was being recorded at Stax, and there were social, political, and cultural changes that are reflected in the music on Stax 68: A Memphis Story. Stax 68: A Memphis Story is the latest lovingly curated box set which is a reminder of one of soul’s great labels as it rebuilt and reinvented itself after a truly turbulent year. ← KEITH MANSFIELD AND JOHN CAMERON-VOICES IN HARMONY. I read your post with interest as a big fan of Stax and Atlantic. I feature a lot of music and singers from these labels. Stax is an important music ‘documentary’ of the time.